Also Called: Poison parsnip, spotted water hemlock, spotted cowbane. Stems: Erect, stout, branched at top, glabrous, often waxy, hollow, often with purplish spots and stripes; base of stem enlarged, chambered, contains yellowish, oily secretion that is highly poisonous. Leaves: Alternate, 2-3 pinnately-divided, uppermost leaves sometimes simple; stalks 4 to 12 inches long, clasping; leaflets narrowly lanceolate, 1 to 5 inches long, .2 to 1.6 inch wide, glabrous, margins toothed. Inflorescences: Umbels, numerous, compound, 1.6 to 5 inches wide, terminating stem and branches; rays 14-27; stalks 1 to 4 inches long. Flowers: Tiny; bracts narrow, linear; petals 5, rounded, white; stamens 5. Fruits: Egg-shaped to circular, to 1/6 inch long, glabrous, 2-seeded; seeds flat on 1 side, rounded on other, ridged, straw-colored with dark blotches. Habitat: Stream edges, marshes, ponds, and ditches; wet sites. Toxicity: Water hemlock is highly poisonous. Symptoms of poisoning include nausea, diarrhea, respiratory difficulty, rapid and weak pulse, and convulsions. 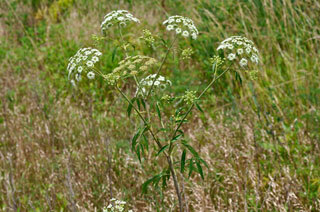 Livestock will usually not eat water hemlock but only a small amount can be fatal. Dead plants remain toxic. Uses: Native Americans would mix the root secretion with rattlesnake venom to poison their arrows and chew the roots to commit suicide. A poultice of smashed roots was applied to bruises and sore joints and used to treat lameness in horses. Corn seeds were soaked in an infusion of water hemlock to repel insects.